In the passive/active debate, performance fees can be key to success for investment trust managers. Fees in the fund management world are a hot topic, and average fees across collective investment funds around the world have seen relentless declines. According to research from Morningstar, the average asset-weighted fee for actively managed equity funds has fallen by 18% since 2013, compared with a 28% decline at passive funds. The fact that passives have got cheaper in absolute and relative terms since 2013 has clearly aided their adoption by investors. 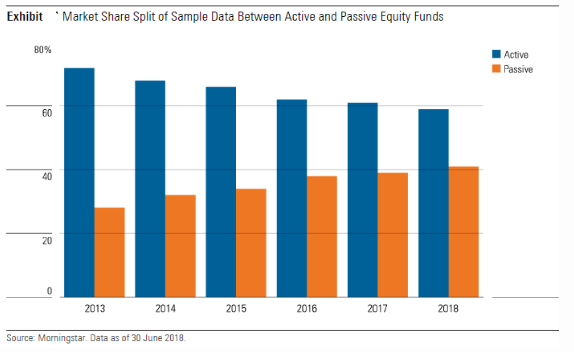 The chart below, also from Morningstar, shows how passives continue to take market share from active funds. However, for the traditional "equity mandate" trusts, passives remain a threat. We have seen several trends emerge within the sector, one of which is managers adopting a higher degree of concentration in portfolios. We believe more concentrated portfolios are a direct result of active managers feeling the need to differentiate themselves from passives. JPMorgan American (LSE:JAM) is the latest big trust to adopt a significantly more concentrated approach, but Alliance Trust (LSE:ATST) approach, adopted in 2017, represents another innovation, offering concentrated portfolios without single manager risk. The other impact of passives is pressure on fees. According to JP Morgan Cazenove, 2018 saw 51 fee changes take effect or be announced. 43 companies cut their base fees in one way or another, with tiered fee structures becoming increasingly common. As a single measure, cutting management fees will not protect investment trusts from the passive onslaught. Investment trusts need to use the singular advantages that they have to compete effectively. Gearing, the ability to buy less-liquid investments or have more concentrated portfolios, and the ability to smooth dividends are all things passive funds do not have. However, ultimately investment trusts need to be significantly more "active". Investment trust boards are in a unique position to incentivise their managers to be so, and at the same time secure lower ongoing costs for investors. Set correctly, performance fee structures enable this, giving shareholders the best of both worlds: a low base management fee, and a performance fee that only rewards the manager if they add value. Being independent custodians of a closed-ended fund, boards can afford to take a long view, and go against the "populist" herd who decry performance fees. They and their advisers can structure rewards that attract and motivate the brightest minds and most talented managers. Where else are managers going to be offered a performance fee? Certainly not the open-ended fund world, which chiefly rewards asset-gatherers. Far from being the Achilles heel of the investment trust sector, we believe performance fees could be the root of its continued success. In our view, with the future bifurcating between those who are resolutely active or passive, there is very little ground for managers to occupy in-between. Recognising this fact, performance fees should help rather than hinder the decision for an investor undecided between an active and passive strategy. Much depends on structuring fees correctly, but in such a scenario, for success in "active" management, the managers are paid for it. For no success, they don't get paid. Fund management is a hugely scalable business. An extra £100m of capital to manage (of a fund which is £1bn in size) doesn't necessarily add 10% more work. However, in most cases, it attracts an extra 10% of management. fees. The fee tapers which more and more trusts are adopting a response to this. However, with a pure base management fee, the simple incentive is for managers to grow the size of their fund. A bigger pot, with the same amount of work to manage it, translates into significantly increased profits. This is despite growing a fund beyond a certain point arguably not being in investors' interests, given the extra constraints it gives an active manager in terms of their ability to invest. Recognising this, but also the threat posed by passive funds, some management firms have gone to extreme lengths to try to align managers with investors and achieve outperformance. Some have abandoned base management fees entirely, although the experience for investors has not been entirely straightforward. Those with long memories will remember Bedlam Asset Management, which threatened to disrupt traditional fund managers by only charging investors when they outperformed. A run of poor performance meant the business lacked the firepower to retain critical mass and remain a going concern. Woodford Patient Capital Trust (LSE:WPCT) has a similar fee arrangement. Following a run of poor performance, the hurdle for the manager to start earning a performance fee is a NAV of c.146p. With the NAV at c.80p at the time of writing, the trust has to achieve an 80%+ return before Woodford Capital receives a fee. With the prospect of a fee so distant, it is possible (although not a certainty) this sets up some perverse incentives for the manager. Shareholders of WPCT could be considered hostages to the fortune of Woodford's open-ended fund – the management fees of which are required to "keep the lights on" for their managers. In our view, the reason a pure performance fee model isn't optimal is best understood through Maslow's hierarchy of needs. Managers (and businesses) need to have enough income through thick and thin to provide enough security that employees (and not just the ones at the top of the tree) feel the business is sustainable. No-one minds poor short-term performance. Cash-flow needs aside, the psychological impact of poor performance on a manager will be compounded if worries that their entire business is suffering are laid on top. Talent needs nurturing, and no more so within active fund management when – by definition - a manager sometimes needs to underperform in the short run, in order to outperform in the long run. Structuring a low management fee that enables the manager to be nurtured, with a performance fee that aligns them with investors, seems the best (and lowest risk) course of action. Alignment is important if performance, not other incentives, is to remain the focus. This is no more so the case than in capacity constrained asset classes. For example, in the rapidly expanding renewable energy infrastructure sector, having performance fees might reassure investors that managers are not chasing assets at ever higher cost (and therefore lower returns) for the wrong reasons. However, there are only two trusts which have performance fees in the sector. For those without this alignment, shareholders must rely on board oversight for reassurance that new investments (and larger funds) are not leading to a dilution of returns below stated objectives. Investment management is part science and part art, but in the end it is a "talent" game. There are relatively few managers who have the magic touch, but the we believe very best deserve to be paid. Talent will find its way to those who reward it best. And performance fees unequivocally reward performance over everything else. Despite what we think are good reasons for having performance fees, trust boards seem to be pushing for managers to abandon performance fees. In 2018 alone, according to JPMorgan Cazenove research, ten companies completely abandoned their performance fees, with only two of those increasing their base fees to compensate. By our calculations performance fees are still fairly prevalent within the "traditional" trust sector (ie those who are not investing in alternative sectors). In total, we have analysed 213 trusts with equity mandates. Of these, 70 or 33% currently have performance fee arrangements. This compares to an analysis of 1,321 open ended funds across IA equity sectors, where we find that only 45 have performance fees, representing a tiny 3.4% of funds. As we note above, investment trust boards have been removing performance fees from managers. By our calculations 42 equity trusts (representing 20% of the universe) once had performance fees but have had them removed. In this context, "alternatives" trusts have seen far fewer removals of performance fees, and their prevalence is significantly higher than with equity mandates, with 45% of trusts having performance fees. The table below shows numbers of trusts with performance fees broken down by AIC sector, showing that within some sectors they are more prevalent than others. Our observation is that performance fees are more often used in sectors where markets are arguably less efficient, with higher potential for a manager to add alpha (such as PE, smaller companies, and hedge funds) as well as those with more specialist or capacity-constrained mandates such as direct property, asset backed lending, and infrastructure. Performance fees are there to be triggered and earned. By our calculations a total of 68 trusts (including alternatives) paid a performance fee in their last financial year. 23 of these were traditional "equity" trusts, representing a third of those with performance fees, and an indication that each manager has outperformed their benchmark. Proportionately, this is certainly better than the average, in which 24% of active managers outperformed their benchmarks in 2018 (study of 2000 funds by Scope Analysis). In total, we calculate that equity trusts paid out around £95m in performance fees, out of a total of c. £473m performance fees paid during 2018. Whilst seemingly a very large number, this was earned off an asset base of £178bn, representing 0.26% of assets under management. Our analysis shows the top ten payers of performance fees in their last respective financial year in the table below. It is worth noting that in some cases these fees were provisioned for, but not necessarily crystallised or paid. We note that most of them have a distinct specialism and/or are capacity constrained. From those in the table above, Jupiter European Opportunities (LSE:JEO) stands out for being neither specialist, nor being particularly capacity constrained. However, we believe it is a live illustration of why performance fees work. Two years ago, the board publicly stated that it had reviewed the performance fee, and (rightly in our view) retained it. The chairman commented that "the Board has come under some pressure - not, may I say, from institutional investors - to consider abolishing the performance element of the fees". They looked at statistics that showed JEO had outperformed peers by a wide margin over the long term, and that the three top performers in the peer group all paid performance fees. They also analysed outperformance over rolling three-year periods, which found that JEO was much more consistent in its outperformance than peers, yet (at the time) the performance fee was earned in only five discrete years out of the seventeen full years since launch. As such, they felt that the retention of the performance fee structure was fair and reasonable. It turns out that the board has been proved entirely correct in retaining it, for last week Jupiter announced that Alexander Darwall, manager of JEO would be handing over responsibilities for his open-ended funds, but would remain manager of JEO. As such, the trust is the only way for non-institutional investors to retain access to Alexander's management skills. Since the board's review, Jupiter has earned another performance fee for the 2018 financial year, equivalent to c. 1.4% of NAV (the maximum performance-related payout is 5% of NAV). Net of fees performance is what counts, and Alexander has proved himself an exceptional manager who deserves an exceptional fee. The long-term performance of JEO relative to the peer group and the sister open-ended fund (with no performance fee) speaks volumes. The recent announcement vindicates the board's earlier decision to retain the performance fee, thereby retaining Alexander's services for shareholders. In percentage terms, the largest performance fee paid in the last financial year, was to River and Mercantile (LSE:RIV), which was paid a performance fee of 3.4% of NAV for River and Mercantile UK Micro Cap (LSE:RMMC). Certainly a micro-cap strategy is very much capacity constrained, and offers a successful manager lots of potential to provide alpha in what is an inefficient market. Aside from these facts, what makes River & Mercantile's fee much more palatable is that it is only paid out when the managers return capital to shareholders. The trust has been structured such that the board feels that net assets of £100m is the optimal size to run the strategy, without overly constraining the ability of the manager to put capital to work in the smallest, illiquid stocks. Each year, it conducts a compulsory redemption of a proportion of the trust's capital to ensure net assets remains around this level. If the trust were to shrink well below this level, it is possible that the board would not make a capital redemption, and therefore any performance fees would be accrued but not paid out to the manager unless and until the trust reached the £100m size again. The sector with the most widespread occurrence of performance fees, is private equity (PE), within which performance fees are typically called "carried interest" and are very much the norm, rather than the exception. Standard carried interest terms are usually a right to 20% of the capital gains. PE managers are required to invest their own capital in their fund, creating a strong alignment of interest - there is downside risk as well as upside potential. Instead of requiring outperformance of a benchmark, an important difference is an absolute benchmark (or hurdle) of 8% pa. As such, a PE manager has to create value ahead of long-term equity market returns before they earn any "performance fees". Another difference is that given the long-term nature of PE investing, it is unlikely that managers will be paid out until 7-8 years after the initial investment, and is on cumulative realised proceeds from the fund. 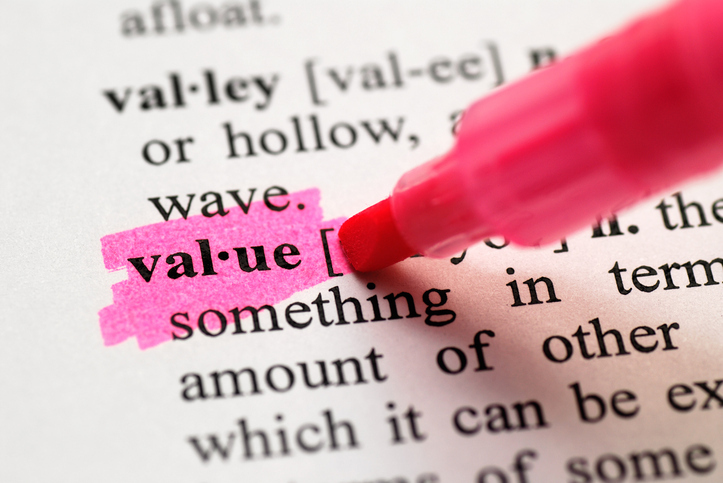 As such, there are no issues over valuations or high-water marks. KID RIY costs (which include historic performance fees paid) imply that performance fees are a bad thing. However, what they actually show investors is that managers have been successful. This is particularly relevant within listed private equity trusts which have an absolute hurdle to beat. Within this context, you can pay no carry (and therefore low KID RIY costs) if you're happy to get an 8% return. However, if you achieve a 16% NAV return, you will pay 4% in carry with the associated high KID RIY costs. We think it no surprise that ICG Enterprise Trust (LSE:ICGT) came out as the best "long-term ISA compounder" in our March 2019 research, illustrating the impressive ability of private equity to generate very strong (net of fees) growth. Performance fees have a simple raison d'etre: management fees are lower than they ordinarily would be, but the corollary is that the manager shares some of the upside of superior performance which motivates them to prioritise performance over everything else. The aim is to ensure clear alignment between investor and manager - and create a win-win situation for everyone. In our view there are two simple tests of their efficacy. Base management fees should be lower than for equivalent funds without performance fees, and net of fees performance should be better. The first test is relatively simple to analyse. We have taken four investment trust sectors which are characterised by relatively similar mandates across trusts, and a representative sample of those with and without performance fees. Within each, we take the median average management fee (sample sizes are small, so median is more representative than a simple average) and compare trusts which have performance fees against those which have never had performance fees. For trusts which have tiered management fees, we have calculated what the effective management fee is at the current AuM (March 2019). As the table below shows, performance fees have the desired effect – base management fees are considerably lower than they would otherwise be, reducing costs by between 5bps and 30bps on average. Investors who are prepared to pay performance fees are benefitting from lower basic management fees. Is net of fees performance better as a result of a more "motivated" manager? We compare performance across the same sectors over various time periods. The UK Smaller Companies trust sector is probably the best "test case" - almost all of the trusts have the same benchmark and have broadly similar approaches. It consists of seven trusts with performance fees, six without, and three which have removed performance fees. Our reasoning breaking the latter group into a separate category is that they cloud the picture: performance fees will have "motivated" for some of the time, but not since they were abandoned. Removing performance fees will have been a result of a negotiation between the board and manager. One of the reasons could be a poor historic performance, or a change of manager. Or it could have been because of very strong performance – there’s no telling, and hence why we think it is worth removing them from the analysis. The graph below shows that over anything but the shortest of time frames, UK Smaller Companies trusts that pay performance fees have done markedly better (net of fees) than those who do not. The picture is the same for the European sector, in which we include the two European smaller companies trusts. The sample is admittedly smaller, with only two trusts paying performance fees, and three without. The majority of this sector used to have performance fees, but have subsequently removed them (seven trusts in total). Again, those with performance fees have outperformed those without. In the middle ground are those which have removed their performance fees at some point in the past. So far, it is looking good for our "pro-performance fee" thesis. Unfortunately for our conclusion (it's never that easy, is it? Oh, how I wish for a simple yes or no answer…) a completely opposite effect is felt within UK All Companies and Global sectors. According to our analysis, trusts which pay performance fees in these sectors have underperformed those which don't have performance fees. Its difficult to work out why this might be the case, but it is worth noting that both sectors are considerably more heterogenous than the much narrower UK Smaller Companies and European sectors which might be playing with our relatively simplistic analysis. Fees are a continuing area of focus for investors. We have demonstrated that performance fees do result in lower base management fees, but they are also (within the UK Smaller Companies and European sectors) associated with better performance. Any conversation on fees is inextricably linked to the active vs passive debate. In the future, managers need to be resolutely active, or cede to passive strategies. There is very little ground to hold between. Recognising this fact, in our view performance fees help rather than hinder the decision-making process for an investor undecided between an active and passive strategy. We believe that investment trusts can position themselves as the last redoubt for active managers, where other structures (in the OEIC- world for instance) continue to buckle under the ruthless competition of low-cost trackers. Investment trust boards should arm their managers for the fight. They should encourage managers to demonstrate their "active" nature by allowing them a flexible mandate, taking a long-term view on performance and giving them all the tools that the structure allows (illiquid investments, gearing etc). They should counter fee pressures by offering managers the ability to walk-the-walk, and align them to successful active management. This is what performance fees are all about. The success of active equity funds rests on the shoulders of managers, but boards of trusts that employ them can - and should - give them enough rope (and motivation) to enable them to do so. So turn the tide investment trust Chairmen! Let's have more, not fewer, performance fees and make investment trust managers more "active" than ever.